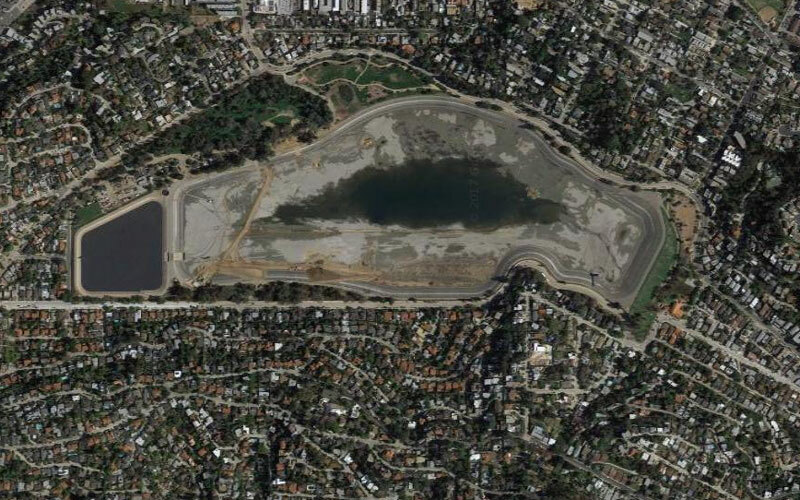 Silver Lake Reservoir will soon get back to being an actual reservoir instead of an unsightly concrete basin. Water will begin pouring into the empty reservoir mid-April, the Los Angeles Department of Water and Power has announced, and it should be full sometime in June. The decision to refill so quickly (it was previously planned to take a full year) is a response to the insane snowpack levels in the Eastern Sierra, which provide water to the Southland through the L.A. Aqueduct. The LADWP drained the reservoir in 2015 in order to build a pipeline to two new underground water tanks—the 110-million-gallon Headworks Reservoir—in order to comply with federal regulations prohibiting open-air storage of drinking water. Remember #shadeballs? Yeah, that’s why L.A.’s reservoirs were covered in shade balls. The reservoir’s revival is cause for celebration for anyone with a penchant for jogging in Silver Lake, as well as those with hopes to turn the surrounding area into a lush, picnic-friendly park.